E. G. Johnson is with the School of Optics, CREOL, University of Central Florida, P.O. Box 162700, 4000 Central Florida Boulevard, Orlando, Florida 32816-2700. J. Stack, T. J. Suleski, C. Koehler, and W. Delaney are with Digital Optics Corporation, 9815 David Taylor Drive, Charlotte, North Carolina 28262. 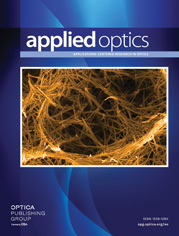 Fabrication of micro optics for fiber optics applications is a challenge due to their size and the issues associated with alignment of the optics to single-mode fibers. This study summarizes a method for fabricating diffractive optical elements on the ends of coreless fiber segments for passive alignment to single-mode fibers. Results are presented for passively aligned diffractive lens elements used for both collimation and beam shaping.